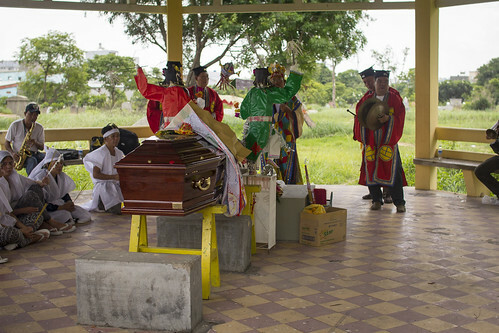 One of the more unusual events I was hoping to capture during my time in Vietnam was a funeral. Having witnessed so many aspects of life in Vietnam, I was also interested in seeing firsthand how Vietnamese pay their final respects. Over the few months that I have been here, I have kept my eye out, always hoping to be in the right place at the right time to witness this very intimate event. Finally, an opportunity came flying past me in the form of a funeral procession. 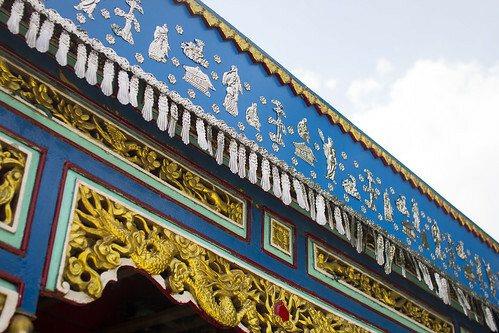 As I waited at a traffic light, I saw three trucks, each elaborately decorated like small temples. 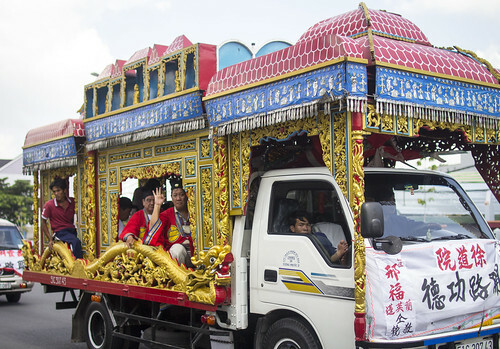 In the front truck, a camera man sat at the back, filming the procession. In the second truck, four Taoist priests sat dressed red, joined by a few other workers. In the final truck, mourners in white sat around the casket, while one man in the back and threw paper money along the road as they went. I had been planning to shoot somewhere else, but knew this was really what God had planned for my day. I quickly maneuvered my moped out of the traffic and chased after the ornately decorated funeral trucks. 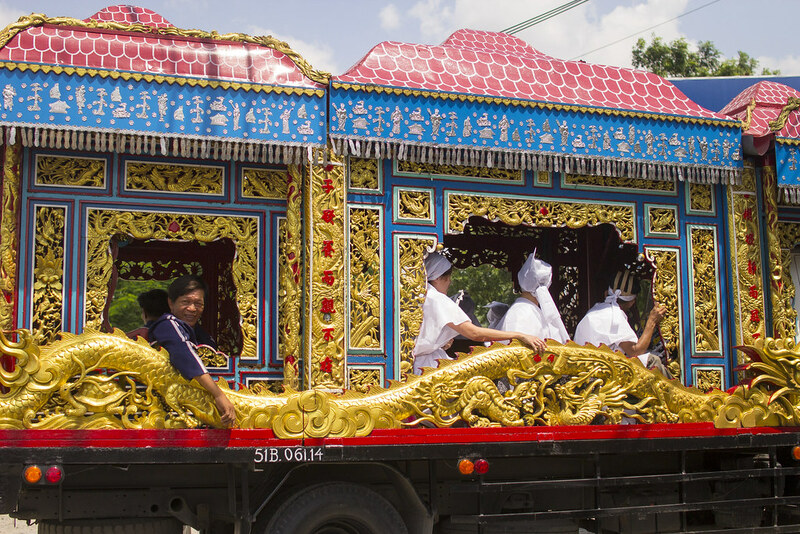 By the time I had gotten out of the intersection, I could just barely see the gold paint and silver chimes of the trucks above the swarms of mopeds that separated me from the procession. I weaved through the traffic as quickly as I could with a decent degree of safety, and caught up with the procession just in time to follow them onto a freeway. Unlike the slow, solemn procession I would have expected, these three trucks were going as fast as possible. Highways here have separate lanes for cars and mopeds, so I was forced to keep up with the procession going 70km while in the moped lane that has a 40km speed limit. Mourners ride on the trucks. After 20 or 30 minutes of following them on the highway, the procession turned onto a muddy road, where two greyhound buses and two vans were waiting. 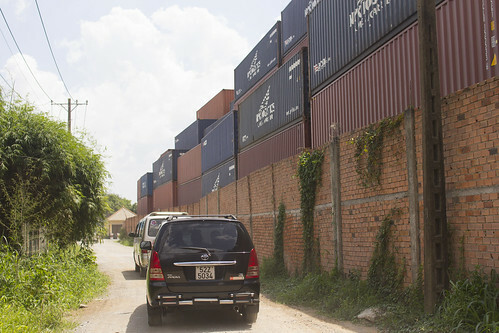 The buses and vans joined the procession, and continued on the bumpy road, passed a shipping yard, and arrived at a cemetery that was hidden behind stacks of shipping containers. 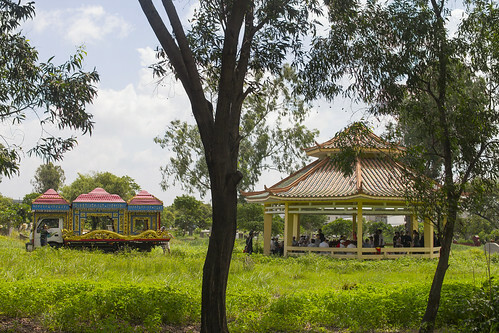 The three trucks parked near a covered gazebo in a field, where the mourners and priests unloaded the casket along with several bouquets of funeral flowers. The mourners and priests were joined by a group of female musicians from one of the vans. The two greyhound buses unloaded. 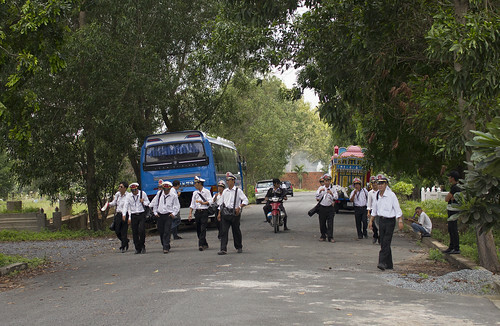 Family members immerged from one of the buses and headed for the gazebo, while a marching band of middle-aged men got off the second bus and lingered in the shade along the one road of the cemetery. More workers emerged from the final van, carrying a roasted pig and loaves of bread. 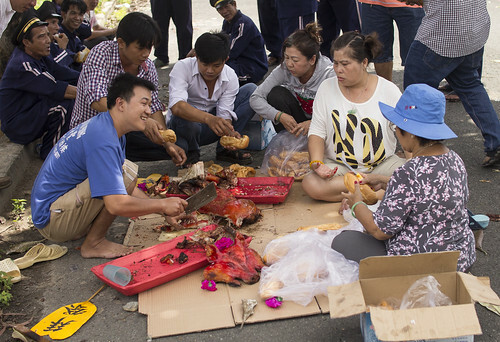 These workers began cutting up the pig and passing out sandwiches to the family and all other attendees. While the family seemed somber, most everyone else seemed upbeat. To them, it seemed to be just another day at their job. When the group serving sandwiches saw me, they offered me a baguette as well. I had planned to leave at the slightest sign of disapproval of my presence, but everyone was very welcoming, so I stayed a little longer. As I watched from a respectful distance, the service began. 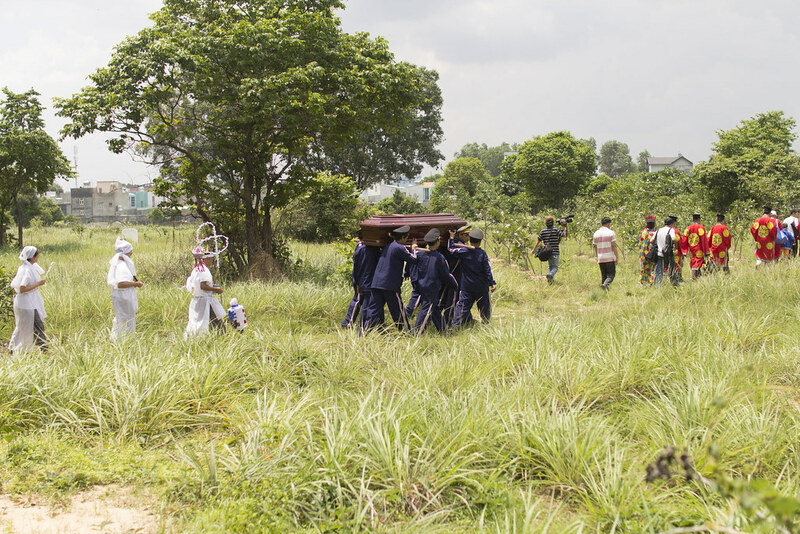 With the mourners seated to one side and the family on the other, the priests performed various rituals. The cameraman stood behind the mourners, filming everything. 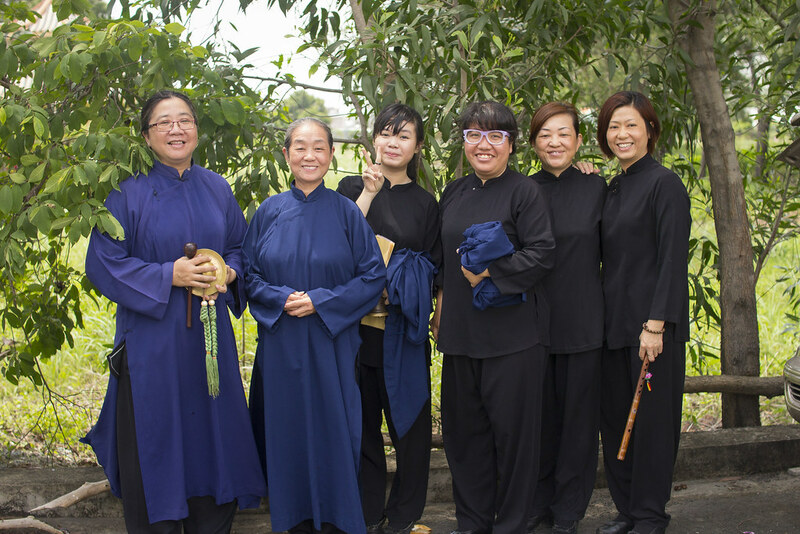 Incense was burned, and gongs were clashed. Prayers, songs, and chants were recited. There were several idol-like figurines made of paper. After the priests were finished with these idols, someone would take them out of the gazebo and burn them. After a while of this, the marching band gathered, music was played for several minutes, and the noise rose to a final crescendo, and then the music stopped. The mourners in white stood up, and circled around the casket, offering what seemed to be prayers or blessings. More of the paper figurines were burned. The marching band disbanded, and the casket was prepared to be taken to the burial place. A final procession formed. A handful of musicians with cymbals, drums, and gongs led the way, followed by the priests. Next a group of men carried the casket, and as they passed, I caught a glimpse of a picture hanging on the front of the casket. The photograph was of a woman, maybe in her fifties or sixties. After the men carrying the casket, the mourners in white were joined by the family followed behind. 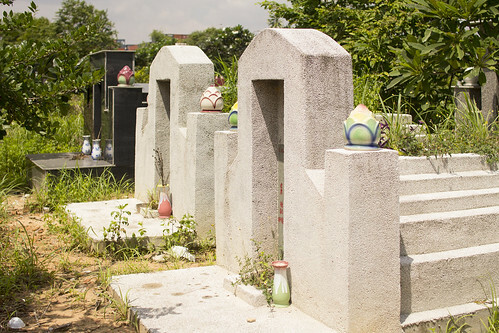 The group began to gather around the burial place, and I decided it was time to give the family some privacy, and left. Because ancestor worship is practiced in Vietnam, I know that the woman being remembered at this funeral will now be worshipped by her family. Like funerals in many other Asian countries, I know that this funeral was so elaborate in order to ensure safe passage for this loved one into the spirit world. The children of this woman will set up an altar for her in their homes. They will offer prayers, burn incense and paper money, and even make offerings of food and drink so that she will be comfortable in the afterlife. It is heartbreaking to realize that all of the efforts of this loving family are in vain. This family and millions like them live each day with the false hope that their good deeds--for themselves and for their ancestors--will be enough to bring salvation. May we no longer sit back and watch.